He dies halfway through, obviously. 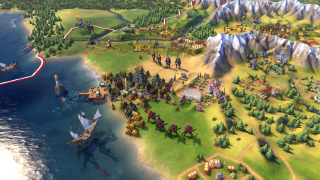 Sean Bean, of Sean Bean fame, has narrated a playthrough of Civilization VI's E3 demo and, somehow, it's even better than you're probably thinking. It's a detailed look at Firaxis' latest 4X, some 12 minutes long, and blimey doesn't it just look lovely? Beany—I call him Beany, he doesn't mind, or know—charts the progress of a civilization from its first formative steps out into the wider world, through to its eventual travels in space, encompassing run-ins with other civs (including nasty wars) along the way. Previously on the Civ 6 infotrain: a look at the game's newly sprawling cities, and Chris Livingston's hands-on with its first 60 turns. Between this and Kholat, Sean Bean is proving to be pretty wonderful at the whole narrating thing.